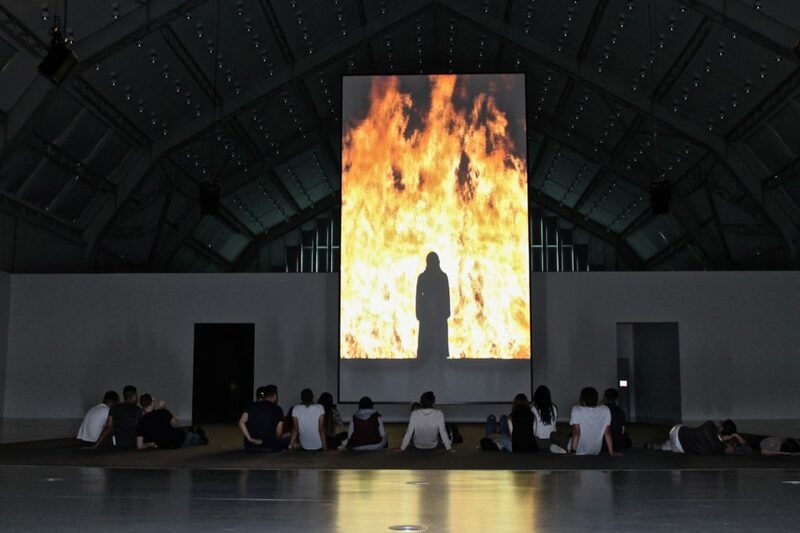 Bill Viola is ranking since 40 years among the best video artists in the world. Works of the in California living artist can be found among others in the Museum of Modern Art in New York, in the Gran Palais in Paris and on the 46th art exhibition biennale in Venice. The Deichtorhallen Hamburg are presenting now 13 of his video and sound installations, some of them on 32 feet high projection screens. The art works of this exceptional artist are mostly dealing with essential human topics: birth, living and growing, and death. He is handling this with various mystical religious movements, like zen buddhism, islamic sufism and christian mysticism. The human body becomes the medium to experience the borderlines of the soul. Stylistically he is often orientated on medieval and Renaissance art, which creates a sacred mood. We can for example draw a stylistically line to Mantegna, Giotto, Andrea die Bartolo and Paolo Uccello. This and also the use of the super slow motion technique emphasizes the atmosphere of the non-trivial, the sacred. 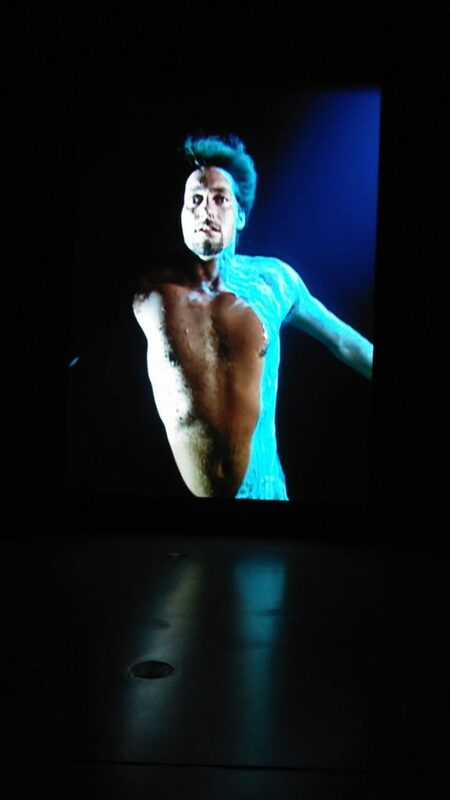 The element water has a significant importance in the artistic work of Bill Viola. Here it is a transformative element, it separates life from death. It is a medium that indicates a transition, from one sphere into another from one condition into another. In the monumental video installation ‚Tristan ascension‘, the audience looks at a lifeless body that is raised by a backwards flowing waterfall. The soul is lifted up and transformed into another condition. The installation is part of a art work that was originally produced for the Peter Sellar opera production of Richard Wagners‘ Tristan and Isolde. For the artist water is a mystic transformer. When he was a young child of 6 years he almost drowned in a lake. He described once this experience not as frightening and negative, but rather as gorgeous and sublime. This experience and the search for recovery of this sublime state has significant influence on his work . In his installation named Nantes Triptych the exhibition visitor is confronted with three different stages of life. In the first segment we see a young woman giving birth to a infant at pains. In the middle is a young man under water who floats in the stream. On the right edge of the screen we see a scene of a dying old woman. Breathing hoses and medical equipment try to keep the exhausted body alive, while through the opened mouth and the tired glazed eyes the rest of life is already leaving the body. The wheel has come full circle at that moment when the young woman holds her new born baby in her arms, and caresses its head, while the dying old woman is also held lovingly by her son. Alpha and omega and the sphere in between. Viola is convinced that the human mainly exist in between the empty spaces between the physical objects. The art works of Bill Viola, are important in a time, when everything dissolves, we need to stop and concentrate on ourselves, and ask the question, who we really are and what we want to do in this world‘, says Dirk Luchow the director of the Deichtorhallen Hamburg. 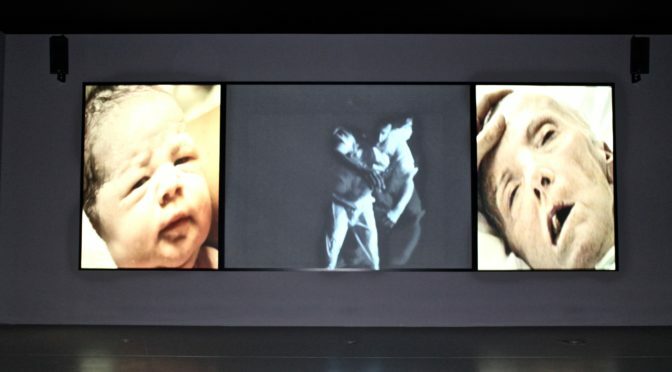 Bill Viola is convinced that there is more than just the surface of life, the real is under the surface. His art opens these gates to the surface also for the visitor who wants to get into that. More information about the exhibiton in the Hamburg Deichtorhallen here.